Musculoskeletal medicine has previously been defined, and its admittedly limited scientific bases have been spelled out. It has been viewed through the eyes of the patient and of the physician, and the important aspect of its economics has been addressed. Its teaching within the orthodox fold has been discussed, with particular emphasis on how easily and quickly this may be achieved, provided techniques are simplified and limited in number, and that all tenets of faith are eschewed, in favour of such valid evidence as has been adduced. Distribution of pain commonly associated with it has been discussed, in particular the phenomenon of referred pain, together with its twin, referred tenderness. Consideration has been given to the vexing question as to whether or not vertebral manipulation, its therepeutic core, will work for the individual patient. No practitioner should contemplate such a prediction! Nor should any patient accept such advice. 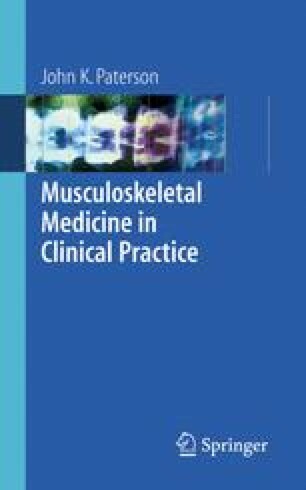 Apart from the shoulder, elbow, carpal tunnel, and leg, the application of manipulation to peripheral structures has been deliberately omitted, as these aspects of musculoskeletal medicine are perhaps even less acceptable to orthodox practitioners.